The Gambel’s quail is an undisputed symbol of the southwestern United States of America, being depicted in photos and paintings very often over time. It is a very old bird species and her behavior and natural beauty are almost legendary. Gambel’s Quails prefer traveling in small packs or family groups and they fly and walk in a single file. They prefer the same method when they are foraging for food in different areas, such as parks, fields and yards. Their normal feeding sessions are either in the morning, or in the late part of the afternoon. With regards to diet, they rely on plants for leaves and seeds, but they will accept and eat insects whenever it’s possible or the season allows it. Cacti are often part of their menu as well. These birds are very well adapted, especially to the warm and dry conditions of the regions they usually live in. This is also due to the fact that they are taking cover during the hottest intervals of the day and thus requiring much smaller quantities of water. 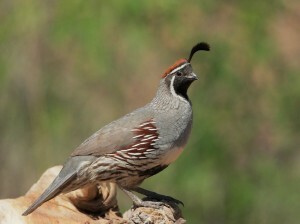 Generally, the Gambel’s Quail is attached to a certain area that it considers a home, but it is not a territorial bird. For this reason, there are many cases in which one bird’s home area is the same or at least overlaps with that of another. Camouflage is the best defense tool the Gambel’s Quail has against predators. They remain still in the vegetation when they sense danger and would rather rely on running if chased, rather than fly away, as their flight is a bit lazy and can’t provide the necessary escape. When feeding in the same area with other birds, the Gambel’s Quail is known to be likely to become aggressive. The weight of a Gambel’s Quail adult doesn’t usually go past 200 grams and their bodies have a rather chunky display. A male can reach up to 28 centimeters in length. A dark colored plume on the head is a trademark for the Gambel’s Quail and it is slender in the cases of females than in the males’. While females have less or no dark markings at all, with a plumage colored in a dull manner, the males have light cream colored breasts which present just one black patch and dark colored necks and heads. Their faces are outline by a white line from the rest of the head which has a rusty looking marking resembling a crown at the top. The color of this bird’s wings is olive brown and the one on the sides is chestnut. The entire gray-brown colored plumage has occasional lighter markings. The United States are the homeland for the Gambel’s Quail, more precisely states including Colorado, New Mexico, Nevada, Texas, California, Utah, etc. this bird even managed to get to Hawaii, but they are very few left there nowadays. It’s easy to keep a Gambel’s Quail in larger groups of birds, since they are very tolerant with other species. The only exception can be during the mating season, when males tent to become more aggressive in order to defend their territories and keep other males away from them. In this instance it is recommended to separate pairs. The Gambel’s Quail finds a mate for life, but there are exceptions in which females go searching for another male and abandon the young to the old one. Mating follows a process of courtship in which bits of food are offered by males. The nests are mostly built on the ground, but sometimes they were noticed on the lowest level of tree branches. Grass, twigs and other similar materials are used for building the nests, whose dimensions are usually around 10 by 40 centimeters. The eggs of the Gambel’s Quail have a smooth texture and are white and brown, with brown presented as spots. The average number of eggs laid is about 11, which the females incubate for around three weeks. Should anything happen to the females, the males will try to continue their incubation. Both parents are involved in the hatchlings’ raising, but single parent are known to be successful, too. At about three weeks of life the little ones can manage to fly. When raised in urban environments, the Gambel’s Quail will pick the pots of thicker plants in order to nest. The level of the soil in the pot mustn’t be lower than 2.5 centimeters from the top, otherwise hatchlings won’t be able to get over. If provided, water must be in very low recipients so that the chicks are not in danger of drowning.